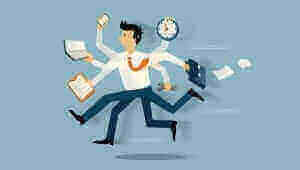 It is a common misconception that we need to work long and tiring hours in order to be productive and to get ahead. The reality is if we work smarter, as opposed to endlessly laboring, we can reach our goals faster while enjoying plenty of sleep, exercise, and vacation time. Start your day by reviewing your calendar. You’ve heard Tony and me speak plenty about blocking time and this is where it will begin to pay off. This allows you to stay organized and prioritize without even having to think about it as you work. Complete the tasks you’ve assigned to yourself in the allotted times throughout the day. Just as important, respect your need to rest throughout the day. Make time for 10-20 minute breaks every 90 minutes give or take. Use this time to take a walk, eat a healthy snack, or catch up on the news. If you work in a bustling environment with many distractions, make sure you find a ‘quiet spot’ where you can have a few moments alone to think or meditate. Allowing yourself time to rest will increase your efficiency and permit you to concentrate on tasks as you tackle them. Avoid staying glued to your office chair all day. Be sure to mix it up by visiting your local coffee shop (one of my favorites) to get some work done. This will allow you to experience some friendly human interaction, which is recharging. You could also consider working at your local library if you need a quieter space than a bustling coffee shop. Just make sure you don’t use these other locations as an opportunity to distract yourself. In sum, if you’re wearing yourself thin by toiling endlessly at your desk…you’re hurting more than helping yourself. Take an hour each Sunday to plan out your workweek, incorporate breaks, and mix it up! Working smarter means taking care of your mental health all while reaching your goals faster than ever before.